May indicate decay or underlying cracks in the tooth. Often the sharp tooth may cut or irritate the cheek or gum. Treatment can be as simple as a quick repair, or if left untreated can lead to loss of the tooth. May indicate decay or teeth grinding. Often the sharp tooth may cut or irritate the cheek or gum. Treatment can be as simple as a quick repair. However if a pattern of multiple broken teeth is starting to occur, teeth grinding leading to tooth wear may also be contributing factor. 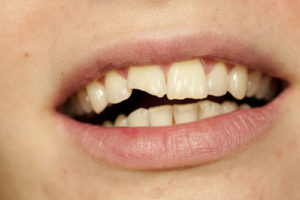 As teeth get worn down, bite pressure can concentrate in different areas and cause teeth to be broken.